Dr. DeHaan is originally from Cadillac, the son of Dr. Loren and Brenda DeHaan. Valedictorian of the 2005 Cadillac High School graduating class, Dr. DeHaan later received his Bachelor of Arts in Biology from Hope College in Holland, Michigan. Dr. DeHaan completed his Doctor of Dental Surgery degree at the University of Detroit Mercy in 2013. While at the University of Detroit Mercy, Dr. DeHaan earned the Dentsply Removable Prosthodontics Award and also served as President of his dental fraternal organization, Delta Sigma Delta. Dr. DeHaan is a member of the American Dental Association, Michigan Dental Association, and the Academy of General Dentistry. 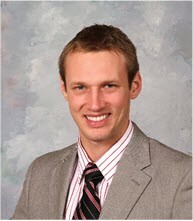 Dr. DeHaan enjoys all areas of general dentistry but is particularly interested in oral surgery and pediatric dentistry. Cameron enjoys playing and watching sports, specifically tennis which he played at Cadillac High School and later at Hope College. An avid outdoorsman, Cameron is excited that his departure from Detroit will allow him to return to his hometown roots where he can enjoy activities such as hunting, fishing, boating, and hiking.